It is a greatly known fact that food excites me. I love researching new food, techniques, restaurants, and planning meals. After spending most of the weekend on the couch with Jason and the girls trying to get over this cold I picked up in Europe, I decided to brighten up an otherwise rainy and dreary weekend by trying out Ina Garten’s seafood gratin. I found the recipe while playing on the Food Network In the Kitchen app (totally worth the $1.99 to download). 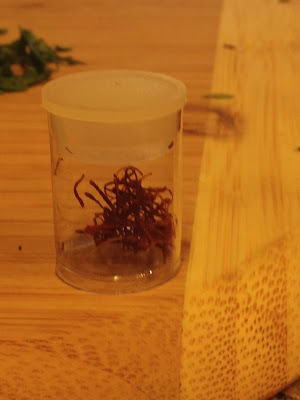 This recipe includes saffron, which I always really like in dishes at restaurants, but had never cooked with until last night. My god, this dish is amazing! It sounds and looks quite fancy. 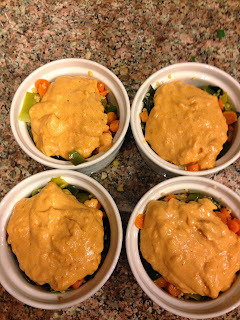 It was very easy to make, doesn’t require much in the way of side dishes, and will definitely be served to future guests. Note: Since there were only two of us eating, I halved the recipe, which was the perfect amount. 3. 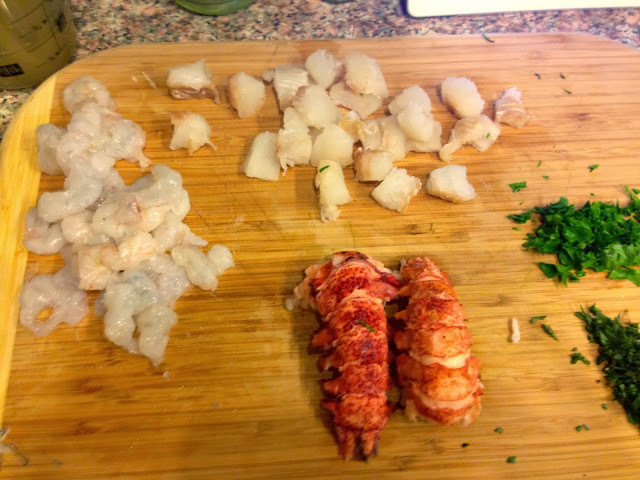 Boil lobster tails: a good gauge for cooking lobster tails is to boil it (them) 1 minute per ounce of weight (ie: 4oz lobster tails should be boiled for 4 minutes); you don’t multiply the time for additional lobster tails being cooked in the same pot. 4. 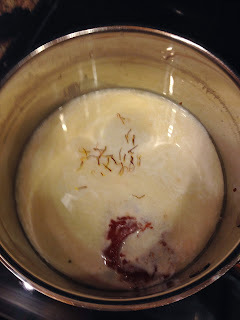 Combine the stock, cream, 1/2 cup of the wine, the tomato puree, and saffron in a medium saucepan. Bring to a boil. 5. Lower the heat to medium and add the shrimp, and keep a steady stir so nothing sticks to the pan. After 3 minutes, use a slotted spoon to remove the shrimp to a bowl. 6. 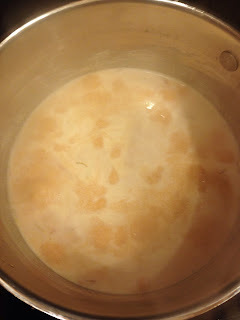 Add the halibut to the stock for 3 minutes, until just cooked through, and remove to the same bowl. Add the cooked lobster to the bowl. 7. Continue to cook the sauce until reduced by half (about 12 minutes; if doing a half portion like I did, mine actually reduced very quickly–approximately 3-4 minutes, so keep a close eye on it), and again stir throughout the cooking time. 8. Mash 1 tablespoon of the butter together with the flour. 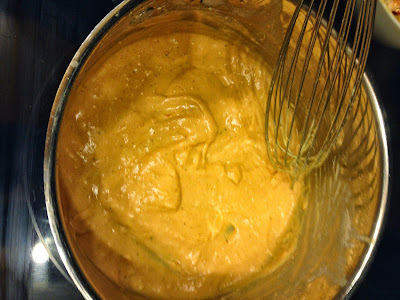 Whisk the butter mixture into the sauce along with 1 teaspoon salt and 1/2 teaspoon pepper. Simmer, stirring constantly, until thickened, about 5 minutes (again, reduced portions will thicken much more quickly: mine did in about 1.5-2 minutes). Set aside. 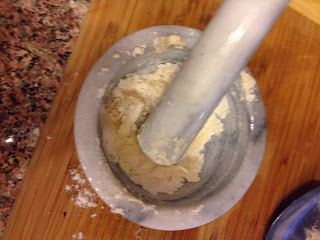 I used my mortar and pestle to mix the butter and flour. 9. Melt 3 tablespoons of the butter in a medium saute pan. 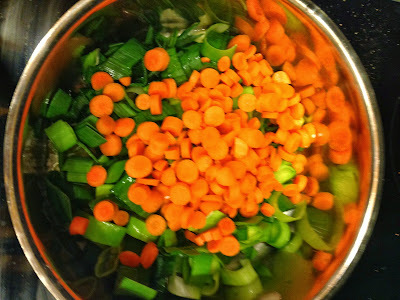 Add the leeks and carrots and cook over medium heat for 5 minutes, until softened. 10. Add the remaining 3 tablespoons of wine, 1/2 teaspoon salt, and 1/4 teaspoon pepper and cook for 5 to 10 minutes, until tender. Set aside. 11. 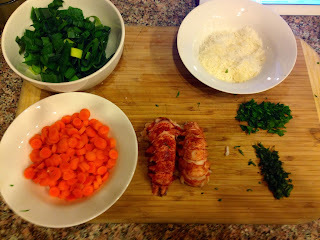 Combine the panko, parmesan, parsley, tarragon, and garlic. Melt the remaining 3 tablespoons of butter and mix it into the crumbs until they’re moistened. 12. 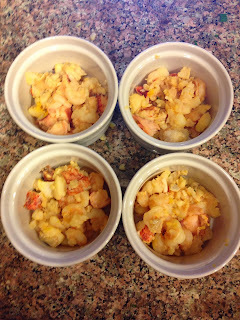 Divide the seafood among the 4 gratin dishes. 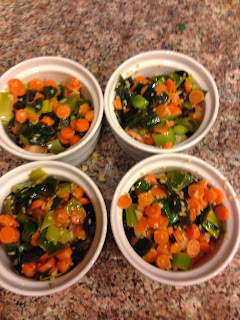 Place the vegetables on top of the seafood. 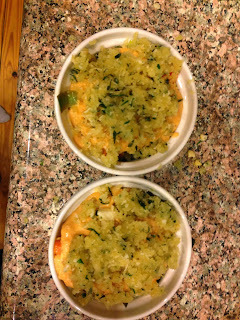 Pour the sauce equally over the seafood and vegetables, and spoon the crumbs evenly on top. 13. Bake for 20 minutes, until the top is browned and the sauce is bubbly. Serve hot. I felt like this should have shining lights on it! 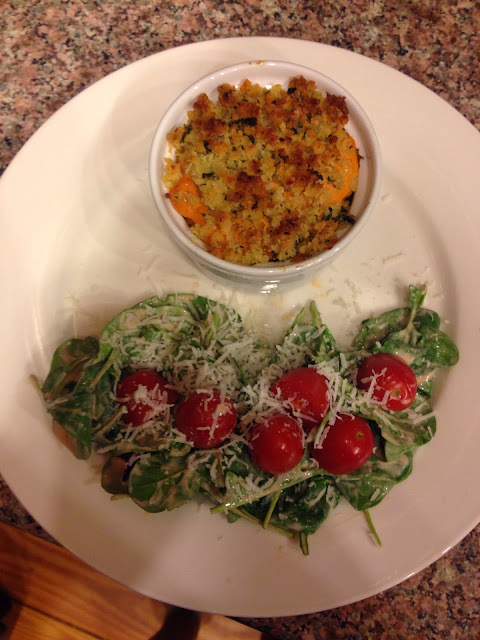 I served the seafood gratin with a simple spinach, arugula, and tomato salad, so as not to overpower the gratin, and with a nice French chardonnay. Add this dish to your repertoire, and you’ll be sure to wow dinner guests!